I hit my two-year business anniversary last month. Two whole years being self-employed! Now that’s a milestone to celebrate and I definitely did a little happy dance on the day. Somewhere though, in the back of my mind, I have to admit that I felt a tiny bit deflated. You see, in all honesty, I’d thought (I’d hoped!) that I might have a bit more figured out by now. And don’t get me wrong – I’ve made loads of progress in that time and business is good – but there’s still so much I want to work on. I can recognise my successes for what they are, but I also feel this nagging doubt; a slightly disappointed and somewhat frustrated feeling that I’m behind where I should be at two years in. There’s the business side of things, like doing more to promote myself on social media and finding more long-term clients; and then there’s the more personal aspects of my working life, too – like finding balance, developing more self-confidence and learning to work through the guilt. And that’s the big one that I want to talk about today. The guilt. One study found that if you add up all the moments you spend feeling guilty – even just a bit – it’d total an average of 5 hours each week. 5 hours! Just think how much you could get done in that time! And it’s ironic, that, because a big part of where the guilt stems from, for me, is to do with not having enough time. First up, there’s the working mum guilt that tells me I’m not spending enough time with the boys. I went freelance so I could be there for them, and yet I often leave them sat in front of the TV or playing on the iPad whilst I’m trying to finish up my work. Even when I do take some time out from work and go down to the park with them for an hour, for example, I spend much of that time checking Twitter, Instagram and emails on my phone. In one way, I know the boys are lucky to have me around so much and that I’m lucky to be able to pick them up from preschool each day and be with them when they’re sick. More often than not, though, I do find myself feeling guilty about one thing or another. So that’s the working mum guilt, and then there’s the freelance guilt as well, which is the completely contradictory – and therefore very confusing(!) – feeling that I’m not putting enough hours into my work. I worry about letting clients down when I’m not able to answer emails straight away, even though I never leave anything longer than a day or two. I worry when it comes to the kids’ holidays, too, or when they need time off because they’re sick. I feel like I’m doing a bad job or disappointing my clients when I can’t be as flexible or as available as I think they expect me to be. But that’s just it. It’s what I think they’re expecting of me. In reality, I’ve found that they totally get it. Most of them are parents too, so not only are they not working much themselves during those weeks, but they’re cool with me not being around as much, either. I still feel guilty though. It’s hard not to, isn’t it, when you rarely feel like you’re in just one world? My attention is constantly being stretched between the two. And outside of all that? Outside of being a mum and a VA? Well, it’s tough to get time for me. Real time, I mean, where my mind can rest and I can immerse myself in a book or an episode of Scandal. Because that’s the thing about being freelance, isn’t it? It definitely gives you more flexibility, but more freedom? Well, that’s debatable. So anyway, do you know what I’ve realised, about guilt? 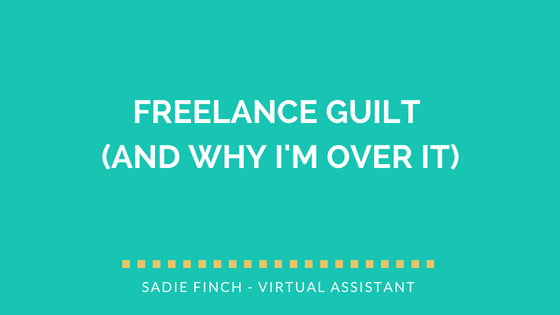 Be it the working mum guilt or the freelance guilt – whichever angle you’re coming at it from – guilt is essentially the same set of feelings wrapped up in different packaging. It’s that little voice inside our heads telling us that we’re not enough. That we’re not doing enough or giving enough or achieving enough. It’s negative, it’s nasty and it’s not helpful. Guilt does have its place, (it’s a social emotion that helps us maintain relationships with others – but I won’t go into that too much, ‘cos meh science), but I know it’s way overstepping the mark in my head. And the main reason for that might be down to external pressures – comparison, competition, the media, society; but it’s only the internal bits that I can change. It’s happening inside of my head, and so it’s only me that can change it. What I’m going to remember, going forward, is that my clients are happy with my work and my turnaround times. My boys are happy and well cared for, and they get to see me a hell of a lot more than they would if I wasn’t self-employed. So most of the time, when I’m beating myself up about not being enough, it’s all nonsense. And that’s the thing about guilt, isn’t it? It’s often not justified. What are you beating yourself up about, and what can you do to stop feeling that way? Thank you for reading, certainly helps me to know I’m not alone! Gah, the juggle struggle is REAL. Be careful not to run yourself down though, Victoria-me is important too! Thanks Nikki, that means a lot.